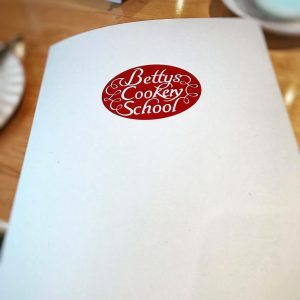 So I’ve finally had a chance to sit down and write a little bit about the fabulous Bloggers Event I was invited to and attended at Betty’s Cookery School last week. 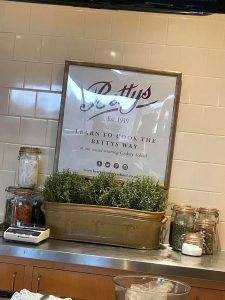 Betty’s is one of those places where its reputation precedes itself. 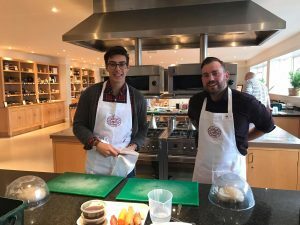 Every time I go to a town with one, there is a queue out the door and round the corner to get in, so you can imagine how excited I was to be invited to a day where these guys were going to teach me some new skills and dishes! The day was supposed to start with a cup of finest Yorkshire Tea and some of Betty’s own pastries. Unfortunately, leaving 3 hours to drive the 70 miles to Harrogate still got me there rather late (!!) 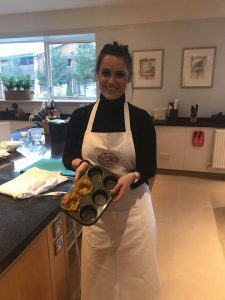 so I ended up quickly glugging down the tea and saying a quick hello to the other bloggers already there in an attempt to not stall things any further!! 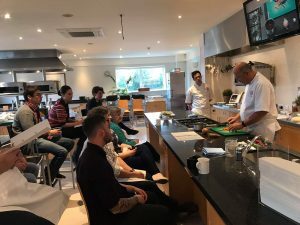 The introduction to the day, a shot of the bloggers during a demo and the lovely pack we received with the recipes we were about to create. The day then got into the swing of things. 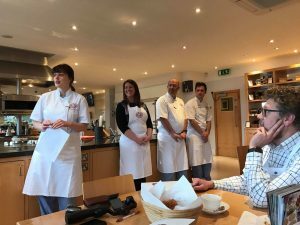 We started off with some introductions to the team who would be guiding us through the day, Jenny Culver, the lovely Victoria Turner (aka The Harrogate Girl) and chefs Chris Taylor and Will Pemberton. 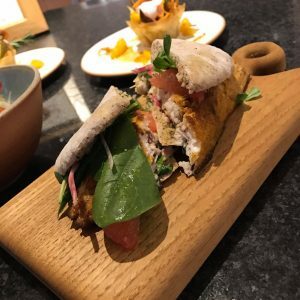 Aprons on, we headed into the first demonstration which focused on the preparation of the ingredients for a lovely Spiced Mackerel Salad with Wholemeal Pittas. 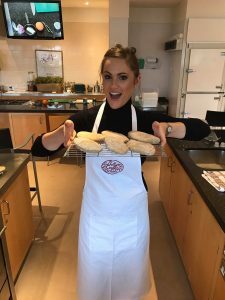 We began learning how to make our own pitta bread which, whilst a little time consuming (seven whole minutes of kneading required!!) was also very easy to do. 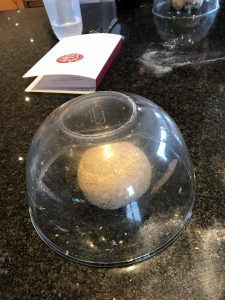 Above – Pitta making – I was very pleased with my little pittas! 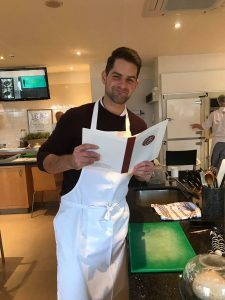 We then moved to learning how to fillet a mackerel from scratch which was a real revelation. Not only was it much easier than I expected but you get so much meat of just one fish (which is very cheap to buy whole!!). 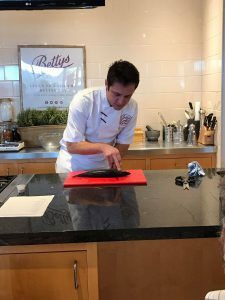 We learnt some key ways to make sure the fish is fresh (including checking if its eyes are still nice and clear – cloudy eyes means ollllld fish!) and how to get two fillets out of one fish. After preparing the rest of the ingredients for the salad, everything went in the fridge for later on. 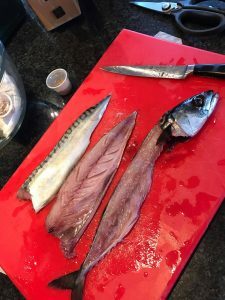 I will be sharing the recipe for this lovely Mackerel salad very soon as it was a real hit when we ate it later on!! 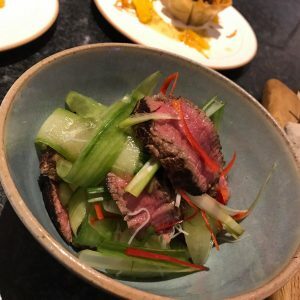 Next we moved onto the second dish of the day, Pan Fried Aromatic Beef with Cucumber Ribbons, Pickled Radish and Chilli and Mint Vermicelli. 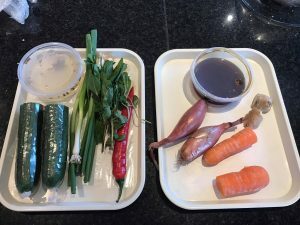 Here not only did we learn how to make our own pickle, but we also learnt a whole new way to tell how well your meat is cooked (involving your face rather than your hand which I am used too!!). 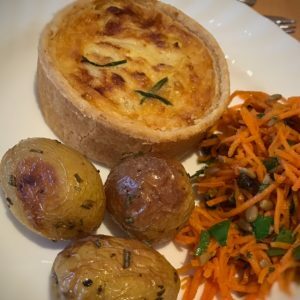 Next we sat down to a delicious lunch which was a Betty’s Individual Quiche with Baby Potatoes and a Carrot Salad followed by some AMAZING orange cheesecake! This gave us a bit of an opportunity to chat more to the other bloggers there on the day and was great fun. 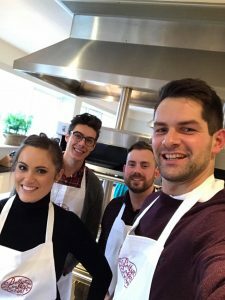 I met some lovely, lovely people (including the UK Yorkshire Pudding Champion, the lovely @y0rkshirepudd) and learnt so much from them too!! The lovely Victoria (@tharrogategirl) and a group shot from our station! 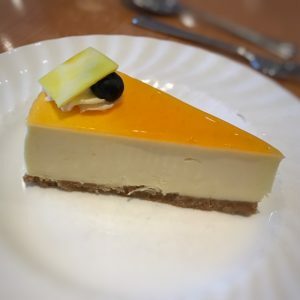 The afternoon saw us move on to preparing dessert which was in contention for my favourite dish of the day. Not only was it again, fairly simple to put together, it was so low in in points and truly delicious. 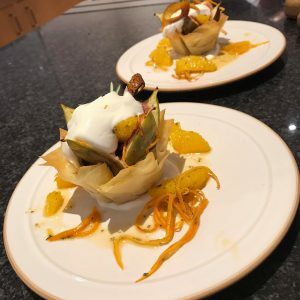 Again the recipe for this will be coming up on my blog soon but for now, here’s a sneak peak…..Honey and Vanilla Baked Fig Filo Tarts with Greek Yoghurt and Burnt Orange. Amazing! The rest of the afternoon was spent watching how to cook the dishes themselves. 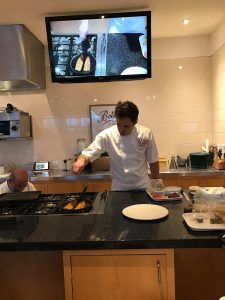 The demonstration was great and the chefs were full of great hints and tips. 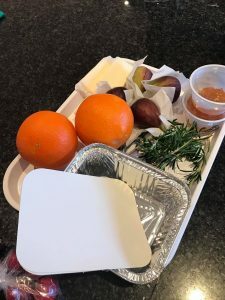 We then had all of our food that we had prepared packaged up and, after saying our goodbyes, took it home to make our selves a slap up three course meal when we arrived home. The final dishes were delicious and beautifully presented! Overall I had a fabulous day. 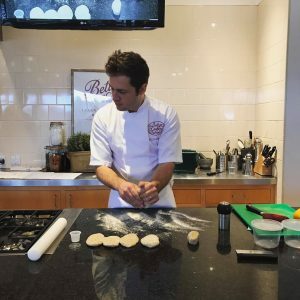 The Cookery School itself is gorgeous with individual cooking stations and stacks of equipment. 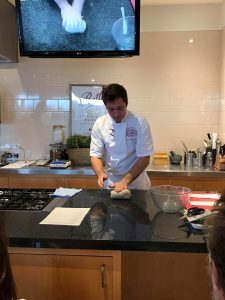 Everything from the organisation to the demonstrations, to the amazing lunch was all perfectly planned, prepared and executed and I am quite confident in saying I will definitely be back to do some more courses here!! 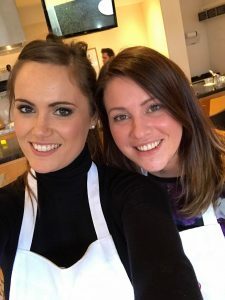 It was so lovely to spend the day with people so passionate about food and was even more enjoyable for me as the food/menu had such a healthy focus on it. 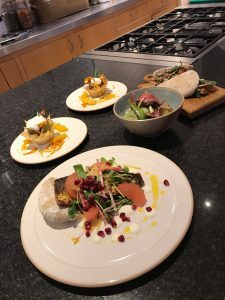 One of my favourite things about this course was that you were able to take everything home at the end of the day and all that needed doing was some frying of meat and plating up and BAM you had the most delicious dinner ready for the evening. The school itself do lots of different courses so there will definitely be something for everyone. 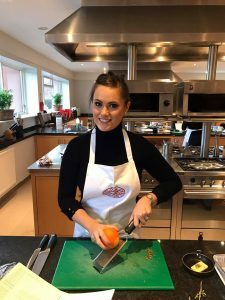 Next time, I’m off to learn some knife skills! !